Broody electro has a new outfit to champion it: meet MS MR, New York's hottest pop export, who'll be hitting XOYO for a headline show next week. London-born Lizzy Plapinger first chanced upon Max Hershenow at University in upstate New York a few years back but it wasn't until after graduation that they came to join forces in making music. At the time, Plapinger’s contribution to the pop world was in a behind-the-scenes capacity, as one of the two founders of trendy record label, Neon Gold, which has been the launch-pad for several UK artists such as Marina and the Diamonds and Ellie Goulding. Hershenow contacted Plapinger looking for up-and-coming Neon Gold artists who might be willing to take a chance on a new producer. Plapinger, who had been writing songs herself, decided to take the opportunity to experiment with someone who was also just starting out and after working on a cover of Patrick Wolf's Time Of My Life together, they quickly and seamlessly fell into a powerful musical pairing. We chatted to the duo ahead of the release of their new single, Fantasy, this weekend and heard more about their work together and about what the forthcoming gig holds in store. Lizzy, you're one of the driving forces behind Neon Gold. What made you want to swap your record label boss hat for a popstar one? There was never really a conscious decision of wanting to step from one world into another. I think I've just always loved music and wanted to work or be a part of it any way I could. I think when you're a huge music lover it's only a matter of time until you test yourself, whether that be publicly or privately, to see what you're capable of. I've always written lyrics and loved singing along to the radio or at a gig etc. but it wasn't until I received an email from Max that I took the leap and tried to more formally start experimenting musically. Looking back, it makes all the sense in the world that this is what I should be doing and all the steps it took me to get here but I think it was a dream I couldn't admit to myself until now when I find that it's being fully realised. You grew up in London. What are your strongest memories of the city as a child? I loved growing up in London and have only the best memories from my time here. I used to go to listen and buy records at Rough Trade in Notting Hill every weekend and go vintage shopping at Portobello Market. One of the best things about this city are the parks, from the adventure playground in Holland Park when I was 8 to drinking beers on top of Primrose Hill when I was 17. I regularly went to gigs; the first show I ever went to was The Rolling Stones at Wembley Stadium before they tore it down when I was 12 and it pretty much changed my life. The music scene here really played a huge role in my love of and relationship with music, especially in my teen years. The same way I think New York has done for me in my twenties. And what took you to New York? Originally, I planned to move back to London after graduation and Derek (my business partner at Neon Gold) would stay in New York, that way we could divide and conquer between the two countries. But while I was at school I was going into the city all the time for meetings and shows so by the time we both graduated we had already started to establish Neon Gold as more of an NYC-based label. Ultimately, we decided we didn't want to split, especially since it was the first time we could work together in the same place. When we subsequently signed a Joint Venture deal with Columbia, New York officially became home. Since then we've never looked back. Would you ever consider settling back in London? Absolutely! I love New York and it's exactly where I want to be at this age and time in my life but I've always thought I'd end up back in London eventually; it's home after all. Is the XOYO gig your first headliner show in London? Max: We've actually already been lucky to headline twice before in London so this will be our third. Our first was at Birthdays and our second was at Electrowerks. We're incredibly excited to be playing XOYO, though! We're still blown away that all three shows have sold out – it means that we're really getting to play for fans and carve out a space for ourselves in the UK. To keep coming back and feel like we have a home here just reaffirms our love for this country. Each show just feels bigger and better than the last! When did you first start taking your music on the road and how have you been finding it so far? Max: We played our first show last March so we've only been playing live for a year. Because we recorded our entire album before we played a gig, transitioning the music from my apartment to a live setting was definitely a challenge. We were adamant that we never wanted to be just the two of us on stage with a laptop so we were faced with the question of how to do the music justice. We ended up rounding out the band for the live show with two amazing musicians – Zach Nicita, who plays drums and is truly one of the most talented percussionists we've ever met, and Curtis Nystrom, who we've affectionately dubbed Go Go Gadget. He plays lapsteel, autoharp, bass, and synths. It took a minute to get used to tour life but we've really found a groove and it's become one of our favorite aspects of the project. What's a typical MS MR gig like? How are the song-writing duties split between the two of you, usually? Lizzy: We're truly a team in the studio and are both totally involved in the development of a song. It starts one of two ways: either Max will write a rough track and send to me to write a topline and lyrics over, or I will write an acapella track with a topline and lyrics for Max to write around. Max: From there we're constantly cross-editing and are both fully involved in the development of the song. As a result, every track represents us both equally – it's a really strong partnership and it's always about what's going to make the song the best version of itself. Not many artists have used tumblr to the extent that you guys have in terms of unleashing new music on your followers. What do you think has been the secret to your success on that front? Lizzy: We were honestly just lucky to find a platform that aligned with our personal aesthetic and creative vision so well. Tons of artists are choosing to release their music in alternate ways and connect with people but it's about finding what medium or social outlet is the best match for you. We were already avid users of tumblr, so the idea of releasing our EP through that platform perfectly embodied our mixed media and collage aesthetic and allowed us to continue developing the relationships we had already created through the site. Max, you started off as a producer – who, to you, are the best music producers in pop at the moment? I think we're in a really exciting and healthy time for music and electronic production specifically – I'm constantly finding new tracks that completely blow me away. Because it's so easy to create high quality tracks with just a laptop and keyboard, which is how we recorded most of our album, there are so many people coming out with amazing new material all the time. Currently I'm really impressed with everything Dev Hynes is doing, Paul Epworth is a big hero, Twin Shadow does some incredible work and I really love Natasha Khan and David Kosten's production on the recent Bat for Lashes record. Charli XCX has remixed one of your previous singles, Bones. Are there any other collaborations or involvements with UK artists planned for the future? Lizzy: Well, first, collaborations are a huge priority for us and we've been hugely inspired by UK music, so that's definitely something we see happening more and more. Max: Kele from Bloc Party – one of our favorite bands of all time – has actually just remixed our new single and we've also been lucky enough to collaborate with Tom Vek, not to mention the ultimate dream, Tom Elmhirst, who mixed our album. Considering that tour merchandise is one of the reliable sources of income for artists nowadays, there's been quite a few lacklustre merchandise efforts on the part of some complacent big artists in recent years. How seriously do you take that side of the relationship with your fans? Lizzy: When you're a new baby band it's a balance between what can we afford to make and travel with so right now we only have t-shirts and vinyl available. But, that being said, we have some pretty grand ideas for things we would like to incorporate in the future. Sooner rather than later, hopefully. We're definitely excited to have some fun playing with different merch ideas and making it something really unique. How did Fantasy come to life? Lizzy: As you might be able to tell from the abundance of backing vocals, Fantasy started as an acapella track that we turned into an uptempo, organ swelling, chant and percussion-driven pop song. The lyrical content started as a reaction to a relationship that didn't turn out quite as I had hoped but then the message evolved and sort of took on a life of its own to more generally being about living in an age of ultimate transparent deception – things aren't as they appear and reality and fantasy live in a constant state of contention. Finally, Lizzy, if you had to show Max three London landmarks, which ones would you choose? [laughs] Well, it would certainly be a tour of my more personal London landmarks but they would, ideally, include a tour of my favorite vintage shopping destinations (Portobello Road on a Saturday morning, Camden Town Market, Brick Lane on Sunday), drinking some beers on top of Primrose Hill, and a trip to the Tate Modern. Fantasy is out this Sunday. 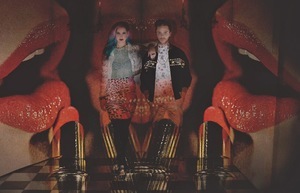 MS MR play XOYO on Monday night. For ticket enquiries, check out the XOYO website.